How Do ABLE Accounts and Third Party Special Needs Trust Compare? 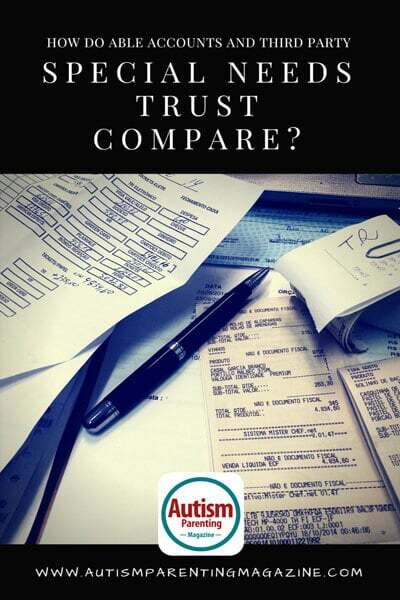 Could you compare, from a high level, ABLE accounts and a Third Party Special Needs Trust? From a high-level perspective, ABLE accounts and Third Party Special Needs Trust are the same in one main way, any money positioned in these accounts are not counted as a resource when an individual with a disability applies for government benefits, such as SSI (Supplemental Security Income) and Medicaid. This similarity means that an individual could have $5,000 or $250,000 in an ABLE account or Special Needs Trust and still qualify for Supplemental Security Income (SSI) and Medicaid. $15,000 annual maximum contribution (+ $12,060 if the individual has earned income matching that amount) for 2018. At $100,000 of account value (contribution + growth) SSI (which is a necessary monthly income for most adults with a disability) will be suspended. Payback Provision to Medicaid at the end of the individual’s life. This means that any money remaining in an ABLE account when the account holder dies is expected to go back to Medicaid. Each state that administers an ABLE account has a maximum, cumulative contribution amount. Limited to investment options allowed by each state that administers their ABLE account. A Third Party Special Needs Trust does not have any of the above limitations. It is very important to understand that all discussions of Special Needs Trusts in this article are only applicable to Third Party Special Needs Trust. Third Party Special Needs Trusts are funded with resources that are not, and never were, owned by the individual with Special Needs. No annual or lifetime maximum contribution. Can own multiple types of assets including real estate, mutual funds, stocks, life insurance, bonds, and more. NO payback provision to Medicaid (as long as Third Party Special Needs Trust is properly constructed). Taxes can be complex and usually requires a well-thought strategy. Ability to begin teaching next generation of manager (trustee) how to use by setting up the special needs trust while parents/caregiver are alive with a small amount of money. It is also critical to know that both the ABLE account and Special Needs Trust must be managed so that distributions from either account are qualified. If money is used for the wrong reasons from either type of account, continued qualification for government benefits could be put in jeopardy. Special Needs Trusts and ABLE accounts are not competitors when developing a comprehensive and coordinated Special Needs Plan, but instead, they can be used as complementary tools to ensure that an individual with a diagnosis has the proper level of support to live a wonderful life. For more information on how to prepare for the future, be sure to contact a financial advisor who specializes in serving families with special needs. A Special Needs Plan is driven by their purpose of Leading Families to Independence through an on-going multi-generational plan. A Special Needs Plan is passionate about families confidently forward. Ryan F. Platt, MBA, ChFC, ChSNC, is a registered representative of and offers securities, investment advisory, and financial planning through MML Investors Services, LLC, member SIPC. A Special Needs Plan is not a subsidiary or affiliate of MML Investors Services, LLC, or its affiliated companies. This article is not a recommendation or endorsement of any products.